Chandigarh,10 Apr: Music not only transcendents language boundaries but it also crosses the barriers of class, social status. A class example of this is being set by city based NGO Theatre Age. For last two weeks, they are holding a musical workshop for slum children where about 20 children in age group of 10 to 18 years are learning fine nuances of music. 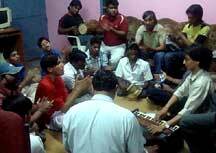 The workshop is being conducted by Mr. Gurnidhi Sharma, a music graduate. The workshop will conclude on auspicious day of baisakhi, the 13th April. On that day they will present a musical evening encasing the compositions prepared by children. Highlight of the programme will be a sufiana quwalli, with opening as “Ali Moula Ali Moula, Ali-Ali”. Raman who is playing Dholak for the show is elated about his experience of workshop Sir Jis tarah Dholak sikhatay hain, dil kay taar hill jatay hain, says Raman. Sahil, a 14 year old, is mastering the art of Aaloap. He says that he feels very relaxed and comfortable after performing in the work shop.